It's no secret that I am a plant addict. Not only do these big green beautiful things look good, but they also have incredible health benefits. On top of that, plants in your home are a wonderful interior design hack. They can turn any dark and dreary corner into a beautiful oasis. They are the perfect complement to a shelf, piece of furniture, empty space or bathroom nook. Lastly, plants are fun- they are something to take care of, watch grow, and change with the seasons. When I first moved to California from NYC in 2015, I used my more spacious living space as an opportunity to fill it up with plants. I didn't really know what I was doing but I just went for it. Now, almost three years later, I consider myself a plant lady. I have plants next to my bed, in my kitchen, crawling up my bathroom wall, and hanging over my studio office. They're like pets, but without the commitment. Waking up every morning and seeing their green leaves definitely starts my day on the right foot. Caring for plants can seem overwhelming, but it's actually quite easy! Below are some of my favorite types, tricks, and routines for my plant babies. Maranta. These guys like high humidity. One day a week, I walk around to all of my plants to see if the soil is dry by sticking my finger in the dirt one inch. If it's dry, I give them a soak. You can also look to see if the plant needs water by their leaves. Perky leaves means the plant's happy, flimsy soft leaves means it's thirsty. Once a month I bathe all my plants (except the cacti). This gives them a nice "rainstorm". Room temp water is best. I pick them up, place them in the tub, and turn on the shower until each plant has about an inch of water on the soil. Then I let them drain there for as long as they need. The bigger plants obviously take longer, so a rotation is always a good idea. Every few months, I walk around with a wet cotton cloth and gently dust off the leaves of the bigger plants (monstera and rubber) it's crazy how dust accumulates on plants, too! Give your plants a nice cleaning by doing this every few months. Light: every plant needs light. Make sure you are giving your plant adequate light. If you notice your plant is looking sad, try shifting it to a different area of the home. Plants like to move around. You'll know when the plant is happy. Yellow leaves: this is normal sometimes. Leaves grow and leaves go, it's like a lesson of life. I like to go around and remove the leaves once it's all the way yellow. Don't remove them until they are fully yellow, though as sometimes they are just changing colors! Housekeeping: go into the soil a few times a year and remove dead and shredded leaves and other weeds. Makes the plant look brand spankin' new! Watering globes are fantastic for those who travel. They slowly drip water into your soil while you are away. *Please keep in mind each individual plant has different needs, so google is a great resource for finding out the individual water/humidity/sunlight levels for each type of plant you purchase. I buy my plants from local nurseries here in LA, but my favorite go-to for find a new one is actually Craiglist! People are so often having to move or relocate really quickly and just want to find good homes for their plants, so they sell them for cheap! It's a gold mine, seriously. I don't recommend purchasing plants from Ikea, they are normally in rough shape and don't last long. If you are interested in training your ivy to climb the walls, I give them a fair amount of sun and let them grow long. As the branches get longer, I stick a nail or tack into a wall, and place it on top. This helps move the direction the ivy grows. Propagating (or, breaking off a piece of a plant to let it grow its own roots) is also a wonderful way to double your plants. You can propagate most plants and succulents with a little bit of time and patience. Great way to split a plant with a friend! 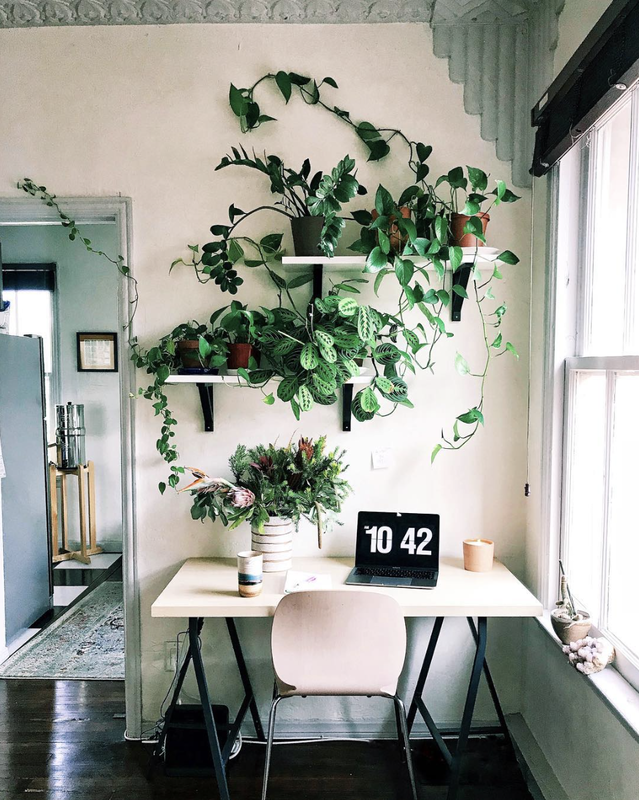 I hope these tips help you all get inspired to bring some plants into your home! I love mine, and I'm never looking back. If you already care for some, what are your favorites?